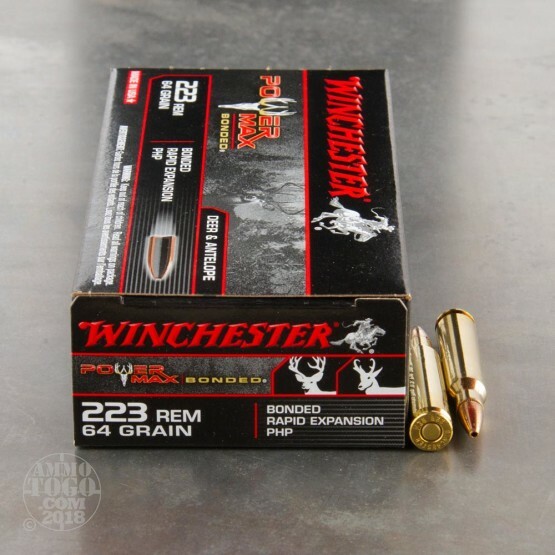 This is .223 Winchester Power Max Bonded 64gr. Protected Hollow Point Ammo. Designed for the whitetail deer hunter, Power Max Bonded ammo delivers maximum performance at an affordable price. The bullet design promotes long range accuracy and initiates maximum expansion to provide dramatic knock down power. Protected Hollow Point Bullet, Contoured Jacket, Bonded Core Technology, High Retained Weight. Brass cased, boxer primed, non-magnetic and non-corrosive primers. This ammo is packed in 20rd. boxes.